Over the last decade, Epiphone has built up a reputation for offering the highest quality electric and acoustic guitars at a price that working musicians canafford. And players especially love Epiphone’s world famous Les Paul guitars for their perfect combination of legendary design and cutting edge technology. Epiphone knows that players take great pride in owning a real Les Paul. 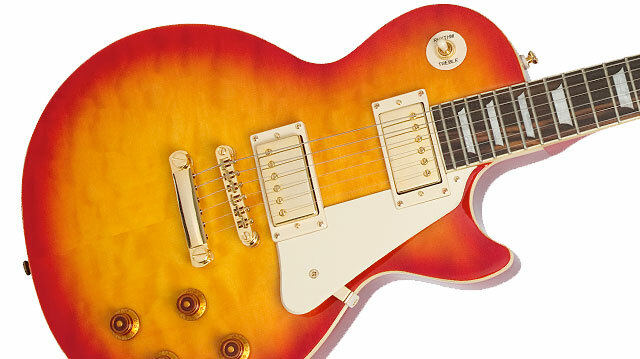 The Les Paul—after all—has been the #1 choice for the world's top players for 50 years. Today, artists like Joe Bonamassa, Zakk Wylde and Slash are never seen without them. And Les Paul himself was one of Epiphone’s biggest fans. Today, players want the best of both worlds—a vintage look with something extra under the hood. That’s where Epiphone steps in! Introducing the Epiphone Les Paul Ultra PRO. The Epiphone Les Paul Ultra PRO has all the great features that Les Paul players expect from Epiphone, including new ProBucker™-2 and ProBucker™-3 4-wire humbucker pickups with coil-splitting on both volume controls, plus a weight-relief mahogany body, a “belly-scarf” that makes the Ultra Pro comfortable for hours of play, and a gorgeous quilt maple top. Like all Epiphones, the Epiphone Les Paul Ultra PRO delivers where it counts andincludes a Lifetime Limited Warranty and Gibson’s one and only 24/7/365 Customer Service. Make your next guitar a Les Paul Ultra PRO. See your authorized Epiphone dealer today! The Epiphone Les Paul Ultra PRO features a strategically chambered mahogany body that is carefully balanced to provide a lighter weight without impacting the Les Paul’s classic full body tone. The Ultra PRO’s glued-in hard maple neck is preferred by many Les Paul devotees (including Zakk Wylde) as a great combination for lead players who love the upper register "bark" that maple provides when combined with a mahogany body. The hard maple neck has a classic 1960s SlimTaper™ "D" profile with a satin finish and a 24.75” scale. The rosewood fingerboard has pearloid trapezoid inlays along with a 12” radius, 22 medium jumbo frets and a 1.68” nut. The fingerboard features singly-ply cream binding. 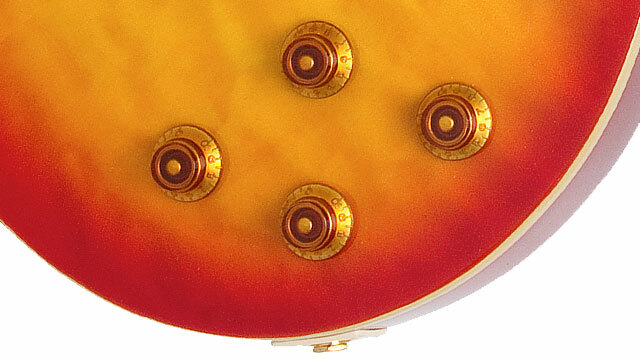 There is also singly-ply cream binding on the top of the body along with a cream pickguard for a classic Les Paul look. Along with the lighter weight, the Ultra PRO includes a “belly-scarf," which makes holding the Les Paul Ultra PRO for long gigs a breeze. The Ultra PRO features a gorgeous quilt maple veneer top that is available in two color finishes: Faded Cherry Sunburst and Vintage Sunburst. The Les Paul Ultra PRO now features Epiphone’s ProBucker™ pickups, a 4-wire design inspired by Gibson’s legendary BurstBuckers™, which recreate the sound of the original hand-wound "PAF" humbuckers made by Seth Lover at the Kalamazoo factory in the late ’50s. Epiphone ProBuckers™ feature all the same ingredients as the PAF and BurstBucker™ pickups, including Alnico II magnets, Elektrisola magnet wire, 18% Nickel Silver unit bases and covers, and pole screws, slugs, and bobbins manufactured to Gibson’s original specifications. The result is a phenomenal pickup that, over time, will develop the subtle, one-of-a-kind characteristics that you only can find in vintage humbuckers. The Les Paul Ultra PRO has a ProBucker™-2 humbucker in the neck position, which is slightly overwound for greater definition at higher volumes. The bridge position features a ProBucker™-3 humbucker, which is also slightly overwound for leads that have wide tonal range. Each pickup features coil splitting via a push/pull control at each pickup’s volume knob, which really makes the Epiphone Les Paul Ultra PRO a dozen guitars in one. All volume and tone controls feature full-size500K Ω potentiometers matched with Epiphone’s rugged, all-metal, 3-way toggle pickup selector switch for long-lasting performance. Epiphone players count on Epi’s solid hardware and the Epiphone Les Paul Ultra PRO delivers with the standard setting LockTone™ Tune-o-matic bridge and Stopbar tailpiece. The Ultra PRO Faded Cherry Sunburst model features gold hardware, including gold Grover® machine heads with a 14:1 ratio. The Vintage Sunburst Ultra PRO has nickel hardware along with nickel Grover® machine heads with a 14:1 ratio. A hard case is optional.